Coming home from the neighbours, my husband said, “Come and see how many apples they have! (Okay, he didn’t actually say ‘come and see,’ it was more like, ‘check out all the apples!’) They’ve got more than they can use and said we can take as much as we want.” Thus began the apple harvest. It started as a gorgeous, ridiculously inspiring, adventure. I felt like an early pioneer woman as I googled apple recipes in search of ways to sustain my family using the fruit of the land. The first bucket of apples was transformed into a delicious apple pie. Spicy apple pepper jelly was my next inspiration. I mean, who can resist heat and sweet on cream cheese and crackers?! I’d sent a couple of apples along with my kids in their lunch boxes, but there were still more apples on my kitchen counter. Apple and strawberry jelly for morning toast, I decided. But I was tired and the excitement was wearing off. Though I’d started this endeavour waxing poetic about the crisp smell of apples in the fall, I now wrinkled my nose because the whole house—even my hair—smelled like apples! The breakfast jelly recipe stated that it was important to follow the instructions closely and to measure ingredients carefully if you wanted to end up with a successful product, so I determined to use the proper tools of the trade. I made the first batch using measuring cups and timers. I optimistically followed a ‘healthier’ suggestion thinking I’d gift my family with more of a fruit spread than a jam. Batch two was admittedly more haphazard. I rounded up cups of sugar just in case my kids found the tartness of the apple off-putting in a jam they expected to be sweet. I rounded down time suggestions, because how long can a girl stand over a hot stove stirring apple stuff? By batch three, I was like, no way are my kids going to decide they can’t eat the product of my hard work because it isn’t sweet enough! I didn’t care how much sugar went into the pot. My kids could eat carrot sticks for nutrients. And I didn’t just forget to use the timer, I got completely off task. While waiting for the mixture to boil, I became distracted writing—a blog post ;)—and ended up with a sticky mess all over the stove. The first batches were carefully ladled into cute little pots I suspected were worthy of Pinterest and of being given as gifts in the upcoming festive season, but batch three was poured into quart jars because I’d run out of pretty containers to pour my apples into. Who knew I’d need that many jars? A simple ‘come & see’ ended up turning my day and my kitchen on its head. I was left with an insanely sticky mess, but with a lot of delicious treats as well. 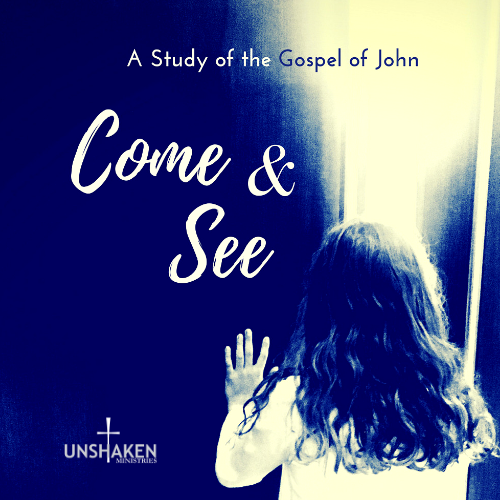 At Unshaken Ministries, we’re inviting you to come & see more of Jesus with us as we study the Gospel of John. (The author is, to my knowledge, no relation to Johnny Appleseed.) Coming on this adventure with us might get a little messy or somewhat sticky at times—that seems to happen when people encounter Jesus. But, if you’re willing to taste and see, you’ll find more delicious goodness in store for you than you’ll know what to do with. So much, you just might start giving it away.